. Glacier National Park Campgrounds provide exceptional camping experiences for the entire family, and this page is devoted to describing the location and details of all the campgrounds in Glacier National Park. Our goal for this page is to help you choose which Glacier Park campgrounds would best suit your vacation plans while touring and camping in Glacier National Park. If you like camping, you'll really love camping in Glacier National Park. There's something very magical and timeless about enjoying a crackling fire with your family and/or friends in this special place. These moments are the ones that really stay with you for the rest of your life. Some of my (Dave) best childhood memories are of sitting around the campfire with my parents and siblings, roasting marshmallows and eating s'mores, all the while telling stories or talking about the day's adventures. It's those memories that are the most vivid of my parents, and it's those times that are nothing but good and care-free, and are always very calming and comforting when I recall those times in my mind. There's just something about Glacier camping! Located near the West Entrance of Glacier National Park at Apgar Village, the Apgar Campground is the largest campground in Glacier National Park. This beautiful campground is just a few hundred yards from the famous Lake McDonald, Glacier Park's largest lake. Apgar Campground is found at the beginning of the west side of the world-renowned Going To The Sun Road, which is the gateway to the interior of Glacier National Park as well as the only road that actually runs through Glacier Park. The Apgar Village area is regarded as the "headquarters" of the west side of Glacier National Park, which makes the Apgar Campground a very convenient location. Apgar Village offers casual dining, gift shops, visitor center, motel, general store, boat rentals, canoe rentals, kayak rentals, a public boat dock, a great beach and more. Located on the Going To The Sun Road, Apgar provides a free shuttle service for those of you interested in heading to the famed Logan Pass (and all the other Going To The Sun Road Turnouts) but don't want to drive your vehicle. Apgar is also a great place to book a Glacier Park Red Bus Tour or guided horseback ride. Apgar Campground is about 10 miles from the iconic Lake McDonald Lodge, and about 16 miles from the ever-popular Trail of the Cedars and Avalanche Lake. These attractions are along the Going To The Sun Road, and are a very quick, easy (and level) drive from this popular Glacier National Park campground. Location: Apgar Village about 2 miles from the West Entrance of Glacier National Park along the Going To The Sun Road. Reservations? Reservations are possible for Apgar Group Campsites only, up to 12 months in advance. The rest of this Glacier Park campground is on a "first come, first serve" basis only. Nearby Attractions: Apgar Village, West Glacier townsite, Lake McDonald, Road to Polebridge / North Fork Area, Lake McDonald Lodge, Sperry Trail (Sperry Chalet, Sperry Glacier), Mount Brown Lookout Trail, Trail of the Cedars, Avalanche Lake, West Side of Going To The Sun Road and more. Avalanche Campground is another Glacier National Park campground that is located in the Lake McDonald Area. Directly next to the popular Trail of the Cedars and Avalanche Lake trail head along the Going To The Sun Road, the Avalanche GNP Campground has 50 sites, and only allow trailer-truck combinations and/or RVs up to 26 feet in length. This Glacier campground marks the beginning of the amazing ascent of the Going To The Sun Road as it works its way eastward up the west side of the Continental Divide eventually reaching Logan Pass. Avalanche Campground is the closest Glacier National Park campground to the west side of the Continental Divide and Logan Pass, and is approximately 16 miles east of West Entrance to Glacier National Park. Just about 6 miles to the west of Avalanche Campground in Glacier Park is the famous Lake McDonald Lodge, and another 9 miles to the west along the Going To The Sun Road is Apgar Village. This GNP campground is heavily forested with huge cedar trees, hemlocks, black cottonwoods and ferns. The vegetation surrounding the Avalanche Campground reminds us of the movie "Jurassic Park". It truly is a beautiful area of Glacier Park and is a popular Glacier Park campground. Throughout the summer the rangers at Avalanche Campground in Glacier Park provide a fascinating evening program at the Avalanche Amphitheater which many visitors who are camping in Glacier National Park seem to really enjoy. Location: Next to Trail of the Cedars and Avalanche Lake trail head, six miles east of Lake McDonald Lodge along the west side of the Going To The Sun Road, 16 miles west of Glacier Park's west entrance. Size: 87 campsites (50 sites can accommodate RV or trailer-truck combos up to 26 feet in length). Additional Features: potable water, flush toilets, sinks, free shuttle service to Going To The Sun Road attractions. Reservations? No. This Glacier campground is on a "first come, first serve" basis only. Nearby Attractions: Lake McDonald Lodge, Lake McDonald, Sperry Trail (Sperry Chalet, Sperry Glacier), Mount Brown Lookout Trail, Trail of the Cedars, Avalanche Lake, West Side of Going To The Sun Road, Logan Pass and more. Fish Creek is the second largest campground in Glacier National Park, and is located about 4.5 miles from the west entrance to Glacier Park. Located very close to Lake McDonald, this Glacier National Park campground provides a fair amount of privacy for trailers and tents alike due to the high number of pine trees throughout this Glacier Park campground, and some these Glacier Park campsites have views of lake. 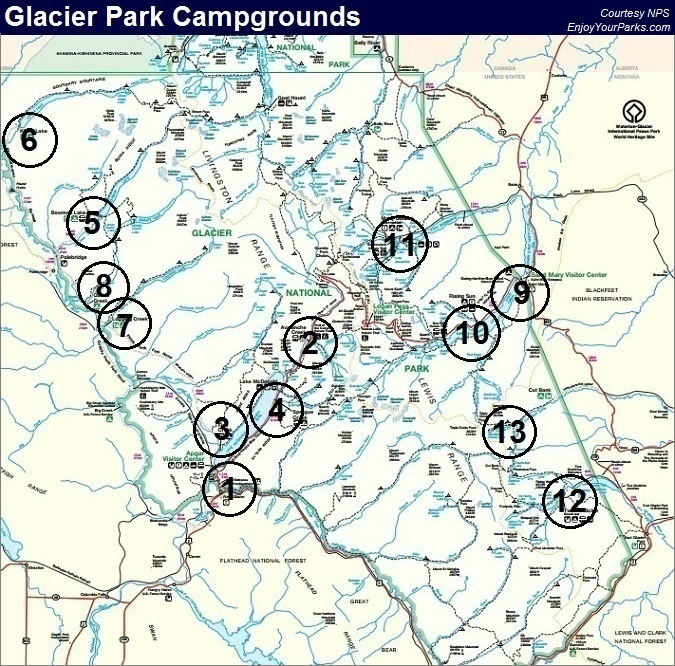 Only a few miles north of Apgar Village, this popular Glacier campground is located near the Camas Road, and marks the gateway to the Inside North Forth Road that takes you all the way to the Polebridge Ranger Station. Fish Creek Campground is only one of two Glacier National Park campgrounds in that take reservations. Location: 4.5 miles north of the West Entrance to Glacier National Park, just a few miles north of Apgar Village, and rests next to Lake McDonald. Size: 178 campsites (18 sites can accommodate RV or trailer-truck combos up to 35 feet in length). Additional Features: potable water, flush toilets, sinks, disposal station and SHOWERS! Reservations? Yes. Click Here. This Glacier National Park campground is one of only two Glacier Park campgrounds that allow reservations (up to 6 months in advance). Nearby Attractions: Apgar Village, West Glacier townsite, Lake McDonald, Lake McDonald Lodge, Sperry Trail (Sperry Chalet, Sperry Glacier), Mount Brown Lookout Trail, Trail of the Cedars, Avalanche Lake, West Side of Going To The Sun Road, Logan Pass, Inside North Fork Road, Outside North Forth Road, Polebridge - North Fork Area, and more. Sprague Creek Campground is one of the smallest campgrounds in Glacier National Park, and because of the design of this Glacier campground, towed units are not allowed. This beautiful Glacier National Park campground is located about 9 miles west of the West Entrance to Glacier Park, next to the southeast shore of Lake McDonald. There's lots of shade available in this wonderful little Glacier Park campground as it sits in a heavily forested area along the Going To The Sun Road. However, because it is located so close to the Going To The Sun Road, unfortunately Glacier Park campers will definitely hear the traffic. Only one mile to the east of Sprague Creek Campground is the historic Lake McDonald Lodge, which is an extremely popular Glacier Park attraction. In addition to the Lake McDonald Lodge, there is a restaurant, general store, Red Bus Tours, boat rentals, wooden boat tours,and more. the upside of Sprague Creek Campground in Glacier Park being located directly along the Going To The Sun Road, is that there is a free shuttle service that will take you anywhere along the Going To The Sun Road, such as Apgar Village, Lake McDonald Lodge and Logan Pass. Location: About 9 miles west of Glacier Park's west entrance and only one mile west of the historic Lake McDonald Lodge along the Going To The Sun Road in Glacier National Park. Size: 25 campsites (no towed units allowed). Additional Features: potable water, flush toilets, sinks, free shuttle service to all Going To The Sun Road attractions, picnic area. Reservations? No. This Glacier Park campground is on a "first come, first serve" basis only. Bowman Lake Campground is located in the northwest section of Glacier National Park known as the Polebridge Area (also known as the North Fork Area), and is a primitive vehicle Glacier National Park campground. This means that there are only pit toilets, no sinks, and potable water is drawn from a spigot. This remote Glacier National Park campground is 32.5 miles from the West Entrance of Glacier National Park, and is found at the end of a very bumpy and dusty gravel road. Because of this rough road, RVs and truck - trailer combinations are not recommended. The upside for those camping in Glacier Park is that the Bowman Lake Campground is located next to the shore of the gorgeous Bowman Lake, which is the gateway to the remote and beautiful Northern Wilderness of Glacier National Park, which takes overnight backpackers to remote places such as Brown Pass, Hole In The Wall and Boulder Pass. This is an extremely popular entrance point (end exit point) for overnight backpackers exploring the northern wilderness. The campground is very pretty and provides fairly nice privacy between campsites, and Bowman Lake is extremely scenic. Kayaking, boating and canoeing is quite popular on Bowman Lake (10 horse power maximum). If you're wanting to experience the "next level" of peace and quiet during your Glacier National Park camping experience, this is the perfect Glacier campground for you! Not many visitors make it up here during their Glacier Park Vacation, and there are no paved highways within 30+ miles! Location: About 32.5 miles north of the West Entrance to Glacier National Park, in the heart of the remote North Fork - Polebridge Area. It is 6.4 miles northeast of the Polebridge Ranger Station. Size: 48 campsites (towed units and RVs not recommended). Primitive: early May to late May, mid-September to late October. Nearby Attractions: Bowman Lake Trail, Brown Pass, Numa Lookout Trail, Quartz Lakes Loop, Polebridge Ranger Station, Historic Polebridge Mercantile, Kintla Lake, Inside North Fork Road, Outside North Fork Road, and more. Kintla Lake Campground is the most northern vehicle Glacier National Park campground in Glacier National Park, and is about 40 miles from the West Entrance. Much of this road is a bumpy, gravel road, therefore RVs and tow units are not recommended. Kintla Lake is located in the heart of the remote North Fork Area (also known as the Polebridge Area) of Glacier Park, and this rarely filled remote Glacier campground is ideal for those Glacier Park campers seeking the highest level of solitude and peacefulness during their Glacier National Park camping experience. Kintla Lake Campground rests at the foot of Kintla Lake, a stunningly beautiful mountain lake that is the gateway into the remote and beautiful Northern Wilderness of Glacier National Park. The famous Boulder Pass Trail begins at this Glacier National Park campground, and follows the north shore of Kintla Lake and Upper Kintla Lake into the depths of the Northern Wilderness of Glacier Park, taking you to Boulder Pass, Hole In The Wall and beyond. This remote area of Glacier National Park is an overnight backpacker's paradise. Boats with motors are not allowed on Kintla Lake, but canoes, kayaks and row boats are allowed. Regarded as a primitive Glacier Park campground, there is only a hand pump for potable water, and pit toilets. 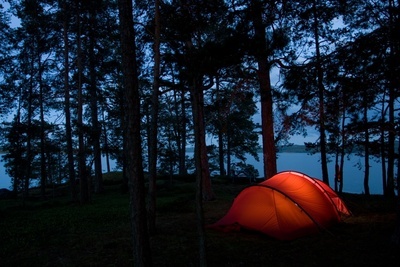 Being about 14.5 miles from Polebridge, there are very few amenities available at the Kintla Lake Campground. The campsites are separated by large logs. Location: About 40 miles north of Glacier Park's west entrance, in the heart of the remote North Fork - Polebridge Area. Approximately 14.5 miles northeast of the Polebridge Ranger Station. Size: 13 campsites (towed units and RVs not recommended). Nearby Attractions: Kintla Lake, Upper Kintla Lake, Boulder Pass Trail, Boulder Pass, Hole In The Wall Area, Polebridge Ranger Station, Historic Polebridge Mercantile and more. Logging Creek Campground is an extremely primitive and remote GNP campground that is found along the rugged Inside North Fork Road in the remote northwest section of Glacier National Park known as the North Fork - Polebridge Area. VERY FEW people ever see this remote GNP campground as very few people ever drive the Inside North Fork Road. So if you're looking for the ultimate level of solitude during your Glacier National Park camping experience, you've found your Glacier campground. Located 9 miles south of the Polebridge Ranger Station, this dirt road is quite rough, winding and "interesting", therefore RVs and tow units are not recommended. There is no potable water available at this GNP campground, but there is a pit toilet. The Logging Creek Campground marks the trail head of Logging Creek Trail, which takes backpackers into the remote Logging Lake Area of Glacier National Park. Location: About 9 miles south of Polebridge Ranger Station. Located along the rugged Inside North Fork Road of Glacier Park. Size: 7 campsites (towed units and RVs not recommended). Open: Primitive only: early July to late September. Nearby Attractions: Polebridge Ranger Station, Historic Polebridge Mercantile, Inside North Fork Road, Logging Creek Trail, Logging Lake. Quartz Creek Campground is located just under 6 miles south of the Polebridge Ranger Station along the rugged Inside North Fork Road of Glacier National Park. This remote road found along the inside border of the northwest section of Glacier Park is a very rough, dirt road with few pullouts and is very winding. Because of these challenging road conditions, RVs and tow units are not recommended. Just like the Logging Creek Campground, you are really getting out there, so if you're looking for the "ultimate level" of solitude while camping in Glacier National Park, you've found your Glacier Park campground- that is if your vehicle will make it there! There is no potable water available, but there are pit toilets. The highlight of the Quartz Creek Campground is the 6.2 mile (one way) hike to the foot of Quartz Lake. This is a very nice hike into a gorgeous remote mountain lake. Location: Just under 6 miles south of Polebridge Ranger Station. Located along the rugged Inside North Fork Road of Glacier National Park. Open: Primitive only: early July to late October. Nearby Attractions: Polebridge Ranger Station, Historic Polebridge Mercantile, Inside North Fork Road, Quartz Lake Trail, Quartz Lake. The St. Mary Campground is conveniently located only 0.5 miles from the East Entrance of Glacier National Park and the St. Mary Visitor Center, and is the largest Glacier National Park campground on the east side of Glacier Park. St. Mary Campground is also one of only 2 campgrounds in Glacier Park that accept reservations, and is the only Glacier National Park campground that takes reservations on the east side of Glacier Park. The St. Mary Entrance marks the gateway to the world famous Going To The Sun Road, which is the only road that runs through Glacier National Park and is by far one of the most popular attractions in Glacier Park. Another convenience of this Glacier National Park campground is the fact that it is just under a mile from the town of St. Mary, which offers several restaurants, a general store, a camp store, a grocery store, gas, hotels and cabins, and more. And being so close to the St. Mary Visitor Center allows you to take advantage of the free shuttle service that takes you to all of the popular Going To The Sun Road turnouts as well as Logan Pass and the Logan Pass Visitor Center. The St. Mary Campground does not provide much shade, but the openness gives Glacier National Park campers great views of the Glacier Park mountains located in the St. Mary area, and there are a large number of aspens throughout this campground in Glacier Park that turn an incredible bright gold in the fall. Because the St. Mary Campground accepts reservations, this is a great place to camp while trying to get a campsite at the Many Glacier Area, which is about 20 miles north of St. Mary. The Many Glacier Area is known as "The Heart of Glacier Park" and is very popular, but the Many Glacier Campground in Glacier National Park does not accept reservations. Instead, it's all on a "first come, first serve" basis. So we recommend that you reserve a spot the night before at St. Mary Campground, then early the next morning drive to Many Glacier Campground and get your spot before it fills up for the day! Location: 0.5 miles from the East Entrance to Glacier Park and the St. Mary Visitor Center. Size: 148 campsites (25 sites will accommodate towed combinations and RVs up to 35 feet in length). Open: : Summer: late May to mid September. Primitive: early April to late May. Winter: early November to late March. Additional Features: SHOWERS, flush toilets, sinks, potable water, disposal station. Nearby Attractions: St. Mary Visitor Center, St. Mary East Entrance to Glacier National Park, St. Mary townsite, Going To The Sun Road, Many Glacier Area. Rising Sun Campground is located along the Going To The Sun Road in Glacier National Park, just across the road from the incredible St. Mary Lake and is just over 6 miles from the East Entrance to Glacier National Park at St. Mary. Its location is amazing because this is where the Glacier National Park mountains really begin to rise into the heavens. Aside from the fantastic scenery, the Rising Sun Campground in Glacier National Park is also conveniently located next to a general store (also a camp store), restaurant, showers and free Shuttle access to the Going To The Sun Road. There is even a really nice 5.2 mile (one way) hiking trail located right next to this GNP campground that takes you to the beautiful Otokomi Lake. And just around the corner from the Rising Sun Campground along the Going To The Sun Road is the Wild Goose Island Turnout, which is undoubtedly the most photographed landscape in the entire park. If you'd like to enjoy a tour of the famous St. Mary Lake on an historic wooden boat, the boat dock is right across the road from this wonderful GNP campground. The Rising Sun Campground in Glacier Park is the closest "east side" campground to Logan Pass, the highest point along the Going To The Sun Road and one of the most popular Glacier National Park attractions. Location: Just over 6 miles from the East Entrance to Glacier Park at St. Mary. Size: 83 campsites (10 sites will accommodate towed combinations and RVs up to 25 feet in length). Open: Summer: late May to mid September. Nearby Attractions: St. Mary Visitor Center, St. Mary East Entrance to Glacier National Park, St. Mary townsite, Going To The Sun Road, St. Mary Boat Tour, Wild Goose Island Turnout, Otokomi Lake Trail. The Many Glacier Campground, located in the world famous Many Glacier Area of Glacier National Park is our personal favorite of all the campgrounds in Glacier National Park, and we're not alone in feeling this way. This is one of the most popular campgrounds in Glacier National Park. The Many Glacier Area is known and "The Heart of Glacier National Park" because of its incredible beauty, world class hiking trails, and the historic Many Glacier Hotel. This popular area is a "must see" for Glacier National Park visitors, and the Many Glacier Campground is the perfect Glacier campground for you to stay at while discovering this amazing area. If you want the ultimate feeling of what camping in Glacier National Park should be like, the Many Glacier Campground is the Glacier National Park campground for you! The Many Glacier campground in Glacier National Park is located in some of the most scenic landscape in the world, where towering mountains surround you in nearly all directions. The Glacier Park campground itself is very beautiful, with just enough openness for you to enjoy the amazing Grinnell Point towering directly above you to the south, and Mount Henkel to the north. The magical Swiftcurrent Creek runs along the campground to the south, which adds to the already breathtaking beauty. This incredible Glacier National Park campground sits right next to the Swiftcurrent Motor Inn, which has a restaurant, showers, camp store and gift shop, as well as a motel and cabins. This is also where the trail heads are located for the iconic hikes to Iceberg Lake, Swiftcurrent Pass and Ptarmigan Tunnel. Just up the road about a mile or so is the historic Many Glacier Hotel, and even closer is the trail head to the Grinnell Glacier Trail, which is one of our favorite hikes in Glacier National Park. Because of the popularity of the Many Glacier Campground, and because it does not accept reservations, getting a spot can sometimes get a bit tricky. What we recommend is that you first get reservations for the St. Mary Campground, which is about 20 miles down the road at the East Entrance to Glacier National Park, and the following morning get up really early and get to the Many Glacier Campground as quickly as possible and get a campsite before these popular Glacier Park campsites once again fill up for the day. Location: About 20 miles north of the East Entrance to Glacier National Park at St. Mary. Size: 110 campsites (13 sites will accommodate towed combinations and RVs up to 35 feet in length). Additional Features: flush toilets, sinks, potable water, disposal station, and showers located at the Swiftcurrent Motor Inn. Nearby Attractions: Many Glacier Hotel, Iceberg Lake Trail, Swiftcurrent Pass Trail, Red Rock Lake, Red Rock Falls, Fisher Cap Lake, Grinnell Glacier Trail, Ptarmigan Tunnel, Cracker Lake Trail, Many Glacier Boat Tour, and more. Two Medicine Campground is located in the wonderfully scenic Two Medicine Area of Glacier National Park, and is another fantastic Glacier campground to experience the true feeling of camping in Glacier National Park. The landscape in the Two Medicine Area is incredible, and is one the the best kept secrets in Glacier National Park. The scenery is world-class, and the hiking opportunities are endless in this spectacular area of Glacier National Park. The Two Medicine Campground is located about 13 miles from the town of East Glacier, and rests near the famed Two Medicine Lake. Iconic mountains such as Sinopah Mountain, Painted Teepee, Mount Helen, Lone Walker Mountain, Grizzly Mountain, and Rising Wolf Mountain dominate the landscape. In fact, this Glacier National Park campground sits directly underneath the mighty Rising Wolf Mountain, which is the tallest mountain in the Two Medicine Area. The Two Medicine General Store is just a few hundred yards from this Glacier National Park campground, as well as the boat dock where you can take a tour of Two Medicine Lake on an historic wooden boat named "Sinopah". This wonderful Glacier National Park campground in the beautiful Two Medicine Area is really beautiful, and it provides spectacular views of the Two Medicine mountains to the west. The trail head to the North Shore Trail and Pitamakan Trail is located right at this Glacier Park campground, which are gateways to some the most spectacular hikes in Glacier National Park such as the Dawson Pitamakan Pass Loop. Just up the road, the trail head to the South Shore Trail is located right by the Two Medicine Lake Boat Dock, and is another gateway to more wonderful hikes in the Two Medicine Area such as Upper Two Medicine Lake, Two Medicine Pass, Rockwell Falls and much more. About a half mile east of this Glacier campground is the trail head to Scenic Point, which is yet another wonderful Two Medicine trail that is quite popular, and further up the road is the Running Eagle Falls, also known as "Trick Falls". These falls are definitely a "must see" while Glacier Park camping in the Two Medicine Area. Location: 13 miles north of the town of East Glacier Montana. Size: 99 campsites (13 sites will accommodate towed combinations and RVs up to 32 feet in length). Additional Features: flush toilets, sinks, potable water, disposal station. 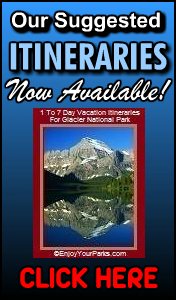 Nearby Attractions: Two Medicine Boat Tour, Running Eagle Falls, Scenic Point Trail, North Shore Trail, South Shore Trail, Dawson Pass Trail, Old Man Lake, Dawson Pitamakan Pass Loop, Upper Two Medicine Lake, Two Medicine Pass, Rockwell Falls, Twin Falls, East Glacier Montana, Glacier Park Lodge (in East Glacier), and more. The Cut Bank Campground in Glacier National Park is located at the end of a 5 mile long gravel road between St. Mary and East Glacier Montana on highway 89, along the east side of Glacier National Park. This primitive NPS campground provides a very secluded, quiet Glacier National Park camping experience that the larger Glacier National Park campgrounds do not often provide. This campground in Glacier Park is located in a gorgeous place, and marks the gateway to several stunningly beautiful hikes into the interior of the famed Cut Bank Area of Glacier National Park. There is no potable water available in this primitive Glacier National Park campground, and because of the dirt road, towed units and RVs are not recommended. Location: Between St. Mary and East Glacier Montana, at the end of a 5 mile long gravel road off Highway 89. Size: 14 campsites (towed units and RVs not recommended). Nearby Attractions: Hiking trails to Triple Divide Pass, Medicine Grizzly Lake, Morning Star Lake, and much more. Camping in Glacier National Park, whether it's with family or friends, gives everyone involved an experience that is very special, positive and memorable. And whether the weather in Glacier Park is perfect during your stay or it rains or snows the whole time, the memories of this Glacier Park camping trip are priceless and something each of the campers involved will share and carry with them forever- and more than likely in a very positive light. And camping in such a beautiful and scenic place, and knowing there's these gigantic mountains all around you in the darkness as you sleep, as if they are "sleeping" along side you- along with the grizzly bears and all the other wildlife, is an incredible feeling indeed. There's something about hearing distant waterfalls or the sound of a nearby mountain stream, or the wind through the canyons while laying in your tent, trailer or RV, or seeing the amazing blanket of stars above you in a crystal clear sky, that makes camping in Glacier National Park a very magical experience that you'll cherish forever.